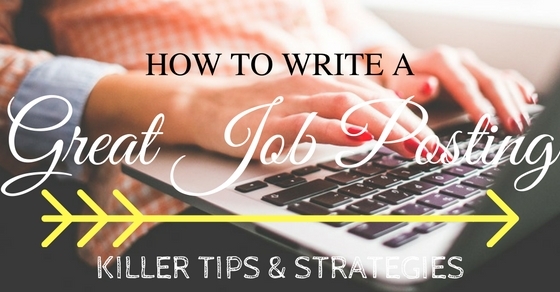 Writing a best job posting is the important stage of hiring the candidates. Exciting vacancies and unlimited growth will keep the organization naturally open. Recruiters looking for well suited employees must initially post their requirement in an appropriate manner. A poorly written posting will express the interest towards hiring the candidates. Importance of writing a great job posting is mentioned below. As all of us know, each and every word mentioned in job posting will make the candidate show more interest towards the job. Few of the recruiters just post ads and expect the candidate to attend the interview, in which they may not get a right candidate. Also one should not expect right candidate just by copying and pasting the company details and motto. The description about the job must be accurate. While writing a job post one must take good care of the words that are posted. Job posting is not only meant for responsibilities and the position but it also depicts the growth of the employee and also about the role that fits him/her into the company. Description has to be given clearly and creative as this will capture and attract the right candidates. Here are some of the tips mentioned. Each and every job description must have appropriate details about the roles and responsibilities of the respective job. Best candidate have lot of options if the job posting is posted in detail. Importance of job has to be elaborated clearly. This logical information will be confined as per the flow of job posting. A good description has to be clearly and cleanly formatted and must also have a flow of data such as description, roles and responsibilities, requirements, contact details and the information about the company. It has to be kept exact to the point. If the hirer wants a best candidate then he/she has to mention the terms and policies, culture, reward etc. while posting a job. When the job is posted, the hirers should check for the consistent terms. While the candidates start searching for job with corresponding title then the job posted must appear on top of the page. Thus the employer has to post consistent words in such a way that the candidate can easily find the vacancies and apply for it. More relevant keywords results will appear on top of the page by progression search. Perhaps each company has its own motto and various job titles, employers have to mention the job responsibilities, details, concession, type of work, industry, scope for growth etc. The link that is mentioned regarding the details of the company should possess the contact number of HR Team. Even though it is a startup company, recruiters has to mention the name of the company, post in the company as the scope of the position matters a lot for all the candidates. Candidates distrust the anonymous companies. It should clearly mention the importance for selecting the company. This also leaves a good impression about the company. Every posting must depict that the respective company is a better place to work in. In the company website name of the company, mission, states, headquarters, operations performed, annual sales and the number of employs have to be mentioned. Even if the company is well known in the corporate world job seekers may not be aware of it. Sometimes, the candidate may be aware of the company but may not be about the products and the process of the company. So it is always recommended for the employer to post the details about the organization truly. Job seekers mainly look into the salary details as money is the immense factor for our living. Job seekers will focus on huge commitment with higher pays. A detailed and splendid package will leave a good thought and impression about the company. This will ensure that the candidates will click of “Apply for the job” button. This will also create enthusiasm for the candidate to join the desired organization. Relevant details regarding the job have to be described and also the profile description has to be mentioned clearly. By adding preferable and minimum qualification the employers can select the best candidate. The position and call to action will create a profile that impacts on the right candidates. It is preferable to keep the job description in 400 to 800 words. By being creative, one can be appealing to the candidates. Employer must also add the latest news about the company. Details regarding the current status of the company will help the candidates to look deep into the organization. Employer should clearly mention the essential qualifications and the skills that are mandatory for that particular job. The details regarding the job experience has to be mentioned as related to the job. When the job is good the applicants should not exaggerate without knowing the exact details about the job. It will become more compatible for the applicants. As job posting is advertisement, people look for the possibilities to get short listed in that company. Highlighting the details about the company and the great opportunities, one can inspire the minds of the candidates. It will keep the job posting as the elements of company will prove that the organization is a better place for the employees to work in. The employers have to understand the current package offered by the other companies so as to compete with the mission importance to select the right and suitable candidate. Ideal candidate will be selected if and only he/she is getting selected in all the interview rounds. The skills required to play the role has to be written clearly. For instance, if the employer is hiring candidate for web development, then he/she has to mention the programming languages such as HTML 5 (along with version), CSS and the backend languages. Culture has to be mentioned honestly. It attracts most of the people to join or to attend the interview. But at the same time it should not be over boarded. Most of the companies mention that the details given regarding the occasional job posts is just the way of explaining that job is on contract. Everything has to be posted very carefully. All the interviewers will mention to attach the resume but even the cover letter is important. This states the information about the qualification, current employee, character and the way of communication of the candidate. This will help the employer to filter the candidates easily. Languages that are more inclusive must be certain and smart. It should satisfy the reviewer. While posting a job, the employer must be more careful because sometimes it leads to miscommunication. This sometimes will also help in additional point that makes the candidate more attractive to the job applied. Several candidates must feel more comfortable as employers will look for the person who is more comfortable to work in their environment and culture. Language should be more inclusive while posting a job. One must add job titles or job descriptions elegantly. It should not be mentioned by using special characters or non-lettered words that will create problems. While writing a job posting it is advisable to avoid using #,!,@,$ etc. These letters will make the posting look informal. Modifiers such as good, great, best can be mentioned on the title. Certain roles that have important rules are to be mentioned as it will be specified in the present opportunity of the company. The position and the requirement has to be modulated with primary concern. The quality of posting advertisement should not be duplicated. If the employer tries to post the active jobs, they will be penalized by the internet content management. Location has to be mentioned wisely. Some of the candidates may not prefer remote areas and also it becomes more strategic. Areas that are remote or unpopularized areas will become strategic for the candidates to attend the interview. It is more effective if the location is in the hub of the city or in popularized area. Being transparent means clearly giving a note regarding duration of interview process. This makes the candidates to rush and get selected. It should be accurate as the candidates may find it easier to walk in. Job posting is an advertisement that entice the candidates into various positions. This internal listing regarding the position and the duration will also talk about the company’s culture. Original posting is for the current employer, this will enroll the role of the current employer. Instead of recruiting a person who quits the current employee role, the employer has to be confident to sense the need and the requirement of the position. Instead of hiring for the same role as of other employees, the employer has to focus on the current trend that satisfies the role. Company’s values and ethics has to be shared in which the employer can specify the business shares and its values. Candidate will focus mainly on the highlighted texts that demonstrate about the company. Skills should be mentioned instead of specifying the years of experience. This will develop a favor and also performance that matches the growth and development of the company. As mentioned earlier the job posting should be remarkable on the brand of the organization. It should hunt for the right candidate and also should scan the details that are made readable using bullet points. The post should be displayed in such a way that it catches the attention of the applicant. Job seekers will focus on the title before reading the data in it. . This depicts the immediate response from the employer regarding the job. Details regarding job may sometimes be for urgent requirement. If the employer wants the candidate who can join immediately, but the recruited candidate is able to join only after a certain period then the employer should CTA to the passive applicant. Engaging more with the candidate will help in finding the right person. This can be done by the employer after analyzing the experience of the candidate in certain field. Job posting should tell the applicant the need and the requirement of the post. By giving more insight employer can save time. The position should be explained more in detail. Caption about the job: It should be attractive so that candidate will be more interested in applying for the job. Job information: Job details have to be mentioned clearly, this includes general roles and duties. Latest news about the organization: By describing few words about the brand name and the company, candidates show more interest towards the profile. Qualification: This is related to the specific education and the experience attributes as per the requirement. Response methods: This speaks about the workplace and also the environment. If the applicants have some clarifications to be done then the response method has to be quick. It can be online responses also. The fact is recruiting people via Internet is not too easy but when the job posting is clearly done, candidates will attend the interview promptly.